Slide your stamps into the little strips on each page of your stockbook. Always use your tongs to pick up your stamps–this is very important. No matter how clean you think your hands and fingers are, they always have natural oils on them that could leave fingerprints on your stamps. It’s always best to use your tongs. Soon you’ll become a pro picking up your stamps with this important tool. Make sure your stamps are always nice and flat when you put them in the strips–try not to bend or fold them. Some of your stamps in your packet may look the same. Use your magnifying glass to examine them closely–there are probably some little differences that you can only spot with the magnifier. Maybe the colors are slightly different, or maybe there is a mark on one of the stamps that the other doesn’t have. Maybe the perforation measure is different. 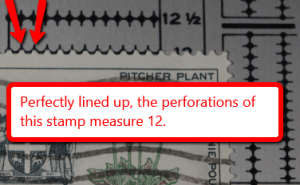 To check the perforation measure, you want to line up the little wavy lines on the edges of your stamp against your perforation gauge. Slide the stamp up and down your gauge until the wavy lines of your stamp match up perfectly with the little dots on the gauge. Now, look to the side to see the number at the end of that line. That number is your perforation measure. The stamp on the left here measures «Perf 12» Sometimes stamps look identical, but their perforation measures are different. What country is your stamp from? Is it Canada, the USA, Romania, South Africa, or some other place on the earth? Learn where the country is by looking on a map or an atlas. Try to learn as much about that country as possible. What year did they start making stamps? If you have a hard time figuring out the country of your stamp because the alphabet is different from English, check our list of different country spellings. 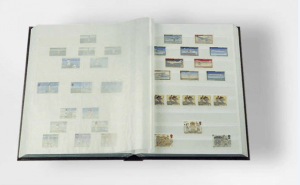 You can find this list in our article «What country is my stamp from?» in Kids Corner. Finally, what is the subject of your stamp? Is it a flower, an animal or a special kind of sport? Do you want to learn more about this subject? Ask your parents or your teacher if you can check the subject on the internet to learn more about it. You may discover some fascinating things you never knew before.